I have been successfully selling my quality Artisan Jewelry, Handmade Jewelry, Gemstone Jewelry, and Knitwear online since 2010 with my Etsy shop. I pride myself on customer service, quality products, and fast shipping. I hope you enjoy taking a look around my shop. My passion is personal adornment. Ever since I can remember, I have draped myself in jewelry and fabrics. My love for creating came early on as I was taught to knit and sew by my step mother. I honed my crafts while living in Saudi Arabia and Jordan for 25 years. Living there for so long has influenced my style greatly. Born in San Francisco, California, I graduated from San Francisco State University with a Bachelor's of Music, voice emphasis, and after a long winding path ( which took me the the Middle East and back)... I graduated from the Gemological Institute of America with my Graduate Gemologist Diploma and I also earned my Accredited Professional Jeweler diploma there, as well. I was introduced to metal smithing while at GIA, and now it is really my favorite thing to do..Watching the metal take form under my hammer is so rewarding that sometimes I feel that it is a living, breathing thing. ( Sometimes, I said). I have a husband, three boys, a granddaughter, and 2 cats. I sing professionally with my quartets, For the Love of Mic, and the Jewel Tones. My best ideas come to me in the shower. They always have. Maybe because I am a Pisces??? 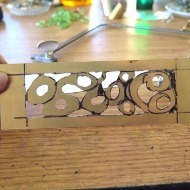 After tracing the design on a piece of sheet brass, I used a jeweler's saw to pierce and cut out the design. 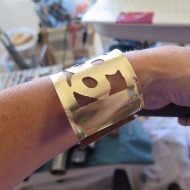 The finished cuff has been hammered over a bracelet mandrel and hand polished. A final step of hammer finishing and polishing, still to do.